Sometimes you only want to sharpen or blur only a small section of the photograph. 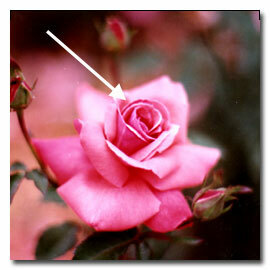 When you apply the blur or unsharp mask, they apply the same amount to each and every pixel to your photograph. When you need to blur or sharpen only a small section of a photograph, that is when the history brush becomes a very useful tool. The instructions below are for the unsharp mask. A blur can be substituted using the same steps explained below. 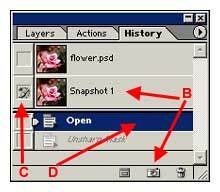 The photographs above show a sharpened center of a rose. The rest of the photograph has remained the same. 3. Choose Filter --> Sharpen --> Unsharp Mask. Enter the following parameters: Amount to 100%, the Radius to 1 pixel and the Threshold to 1. You can change these numbers based the needs of your photograph. Click OK. 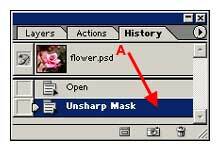 The history screen will display the unsharp mask as indicated in the image below (A). Amount: The percentage of sharpening that will be done to the edges of the image. Radius: The number of pixels in from the color edge that will have pixels sharpened. The higher the number of the radius, the thicker the color edge will be. Threshold: How different the color shifts in the pixels have to be before the filter sharpens them. Hint: It is better to unsharp at lower numbers twice than to unsharp at higher numbers once. Always do unsharp last in the digital editing process. 7. Slowly paint with the history brush the area that you want to appear with the unsharp mask.